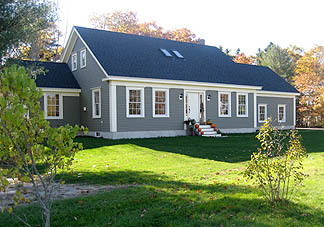 For this family residence, the owners desired the design of house to fit within neighboring historical buildings. 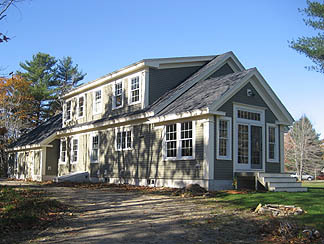 This was accomplished with such elements as clapboard siding, divided light spacing of windows, custom window and door trim, and eave details. 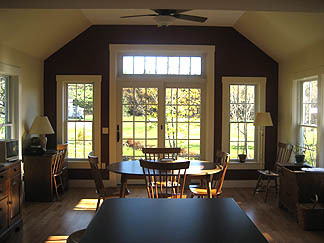 Dining area with kitchen island and french doors and oversized transom. 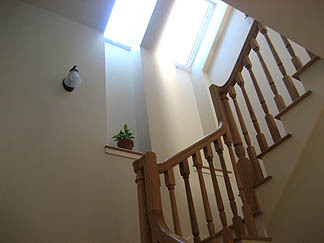 Main staircase with skylights and alcove recessed into kneewall. Over the post rail system. Exterior of dining area enhances the close connection between the living space and the landscape. 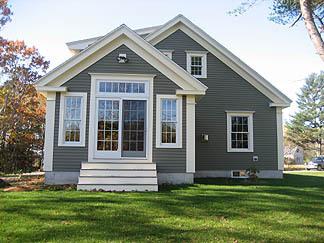 Large windows on eastern side allow solar gain supplementing the propane furnace heating system.